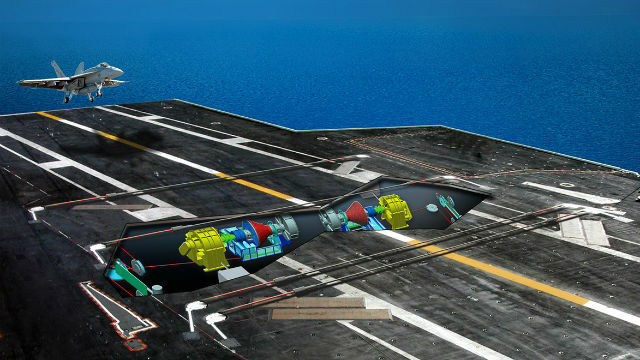 A rendering of the General Atomics Advanced Arresting Gear system. President Trump may have a preference for old-fashioned, “goddamned steam” on the Navy’s aircraft carriers, but San Diego’s General Atomics has won a $195 million contract to install an electric arresting system on the future USS Enterprise. The new ship will be the third to feature the Advanced Arresting Gear system, which couples electric motors with steel cables to catch and stop a landing jet, reducing manpower and maintenance requirements. The Navy once considered cancelling the arresting gear program and reverting to a system used on the Nimitz-class aircraft carriers. However, the new system recently marked the 350th successful test landing of an F/A-18E Super Hornet. The Enterprise will be the third Ford-class carrier built for the Navy by Huntington Ingalls Industries. The lead ship in the class, USS Gerald R. Ford, started sea trials in April and is expected to be delivered in September.